A big part of the reason for that, as Suluku discovered, is because our BSc (Hons) Architectural Technology course is accredited by CIOB (Chartered Institute of Building) and CIAT (Chartered Institute of Architectural Technologists), indicative of the way we work closely with the construction industry to keep our courses up to date and relevant. As BIM (Building Information Modelling) is being introduced in the UK construction industry, I think it’s really good that LSBU has been quick to incorporate that into its courses. Combined with the accreditation, it really gave me the confidence I needed in the course and the University. Suluku particularly enjoyed the architectural design projects he undertook as part of his studies, as well as looking at construction technology. 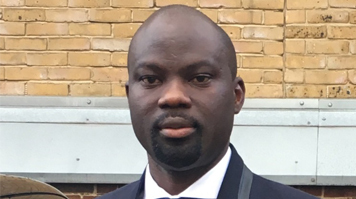 “Studying these areas has given me the knowledge I need to work as part of a team, and the advice and guidance given by the Course Director, Jennie Hardi, was really beneficial, and an essential part of the learning process,” says Suluku.